Praying for your daughter. My grandson had severe food allergies and the doctor said if he didn't outgrow them by age 5, he never would. He was 5 1/2 when he outgrew them. He still gets the effects occasionally if he's had too much of something, but he's pretty good. I pray your daughter's goes away too or at least eases up a bit. It's rough on everyone. I too will pray for your daughter. It's so hard to have that many allergies and be so young! Your cards are just beautiful! 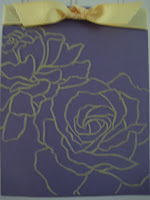 I love the so saffron and perfect plum roses! Something so different than I've seen. So sorry to hear of the trials your daughter is having. Praying for her! The card is beautiful. How did you get the roses So Saffron colored? So sorry to hear of your daughter's troubling allergies! How awful for her....and YOU! I will say an extra prayer for you both. Hope these troubles will soon behind you and you can both get out and enjoy the glorious weather!